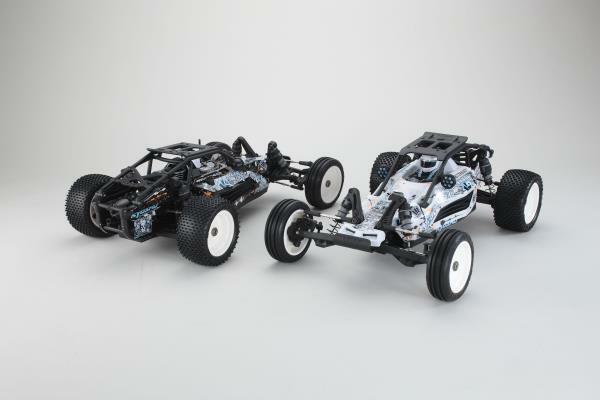 This is the Kyosho Scorpion XXL VE/GP 1/7 Scale 2wd Buggy Kit. At 630mm long, the big 1/7 scale size of the Scorpion XXL has a presence beyond its model framework that generates unparalleled excitement. This machine has a sense of power even before you drive it. This advanced racing weapon has the performance to dominate off-road courses with the insane power and the sure-footed suspension of a large scale machine. But this is not just a machine that blasts around the track. The Scorpion XXL VE/GP delivers the pure essence of off-road enjoyment with unique flexibility never before seen in a vehicle of this type. 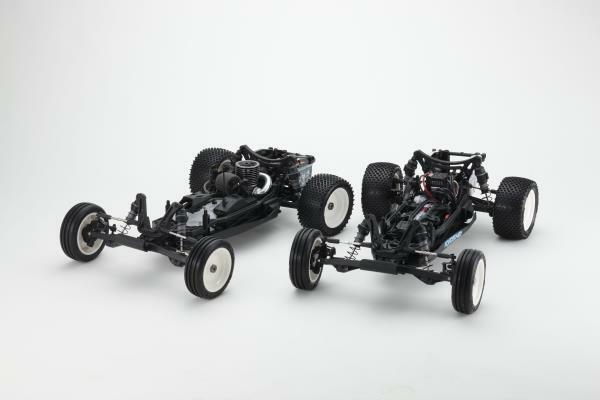 What makes the Scorpion VE/GP unique is the multi-compatible design that allows you to build the buggy in a "VE" electric motor, or a "GP" nitro engine configuration! The kit includes all the necessary chassis componenets, allowing you to pick the power system you prefer. Plus, the design allows you to convert back and forth between nitro and electric power! Each power source has its unique characteristics to be experienced and enjoyed. All you need is the radio system and power system of your choice (electric motor, battery and accessories or gas engine, receiver pack, fuel and starting tools). Additionally, the kit includes a range of performance parts that were previously optional such as universal swing shafts, high grip SXT-003 and SXT-004 tires, with the high-strength steel spur gear. These option parts boost performance and fun even more. Plus, a special spare parts pack made from limited edition neon blue color plastic is included. So for example, in addition to the standard black wheels, blue wheels are also included. This adds a stylish color coordinated dimension to the sharp racing performance unique to this 1/7th scale buggy. What is a KIT? 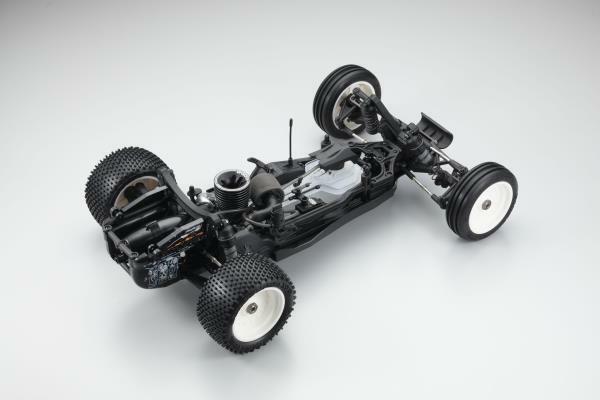 A KIT is a higher level vehicle that includes nearly everything you will need to build a rolling chassis. You will need to supply items like engine, pipe, body, tires, wheels and radio equipment. Required items may vary from kit. Includes limited release colored spare parts! In addition to standard parts, blue neon colored spare parts are included as well. Install onto each section to produce a stylish finish. High grip SXT-003 and SXT-004 tires are included as standard. Both standard black wheels and blue neon color wheels are included. Optional universal swing shafts are included as standard. Allows uninhibited suspension movement and prevents shafts from coming loose. Equipped with large capacity adjustable slipper clutch Includes optional steel spur gear as standard. Heavy Duty Aluminum steering servo horn included. Multi-Compatible Kit lets you enjoy the benefits of both VE and GP! Large slipper clutch installed. Protects drive train from the excessive shock. Minimizes wheel spin. The formidable presence of BIG 1/7 size with dynamic performance! Includes brushless motor mount and Li-Po battery holder as well as engine mount, clutch, fuel tank etc. Features hex type screws for secure assembly and sharp looks too. Tough resin shock stays. Supports smooth movement of suspension. Dummy fog lamps can be fitted on to resin roll bar and on roof.